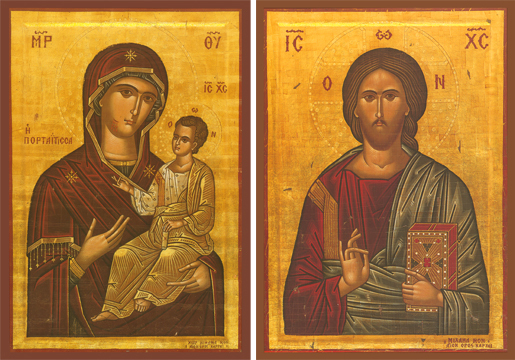 This first set was painted by the Monk Michael from the Holy Mountain of Athos in 1986-1988. The Lord is shown with His right hand giving the priestly blessing, His fingers forming the Greek letters “IC XC”, and His left hand holding a jewel-studded Book of the Gospels. The Virgin is shown with a bleeding cut on her cheek which occurred in the original icon in the following way: once Turkish pirates overran the Iviron Monastery on Mount Athos where the icon had miraculously arrived and stayed. One of the pirates defiantly struck a blow with his dagger to the icon, which was by the door or portal, and immediately the icon began to bleed as if from a fresh wound of the flesh. The astounded pirate repented, converted because of the miracle, and became a monk, living out his life of repentance there and taking care of the icon.